Julia Tuttle was an American businesswoman in the mid to late 1800s who did pretty well for herself. She ended up owning most of the land that Miami now sits on, and is therefore known as the "Mother of Miami". Miamians (?) in her honor, have named a causeway after her. Why should you care? Well, you probably shouldn't, and I don't really either, except for the fact that Julia's causeway caused us to go way out of our way, and was the beginning of one of those days where nothing really goes according to plan. 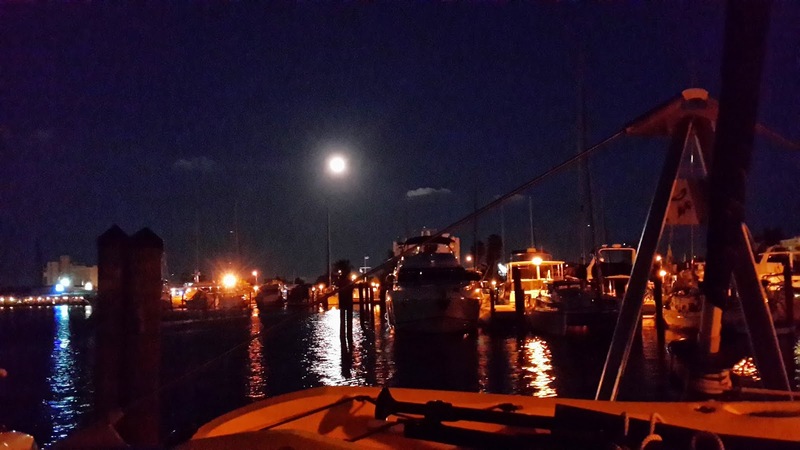 We had headed down to the Hollywood marina with plans to move further south down the Intracoastal waterway into Miami, and then hit a weather window that looked perfect for getting over to the Bahamas. Monday a.m., as we were preparing to head out, I sat down to make a list of all the bridges that we would have to go under, so that when the time came, I'd know who to call on the radio. Everything was ticking along until I got to about bridge #7. That's when Julia got in the way. You see, it turns out her causeway is a fixed bridge (i.e. doesn't lift) which sits 56 feet above the water at low tide. This is a problem for us, since our mast is 62' above the water. Assuming we wanted to keep that extra 6' of mast attached to our boat, we weren't going to make it under Julia's bridge. So, that meant we had to track back an hour north, and head out into the ocean to turn south and sail down the Atlantic in front of Miami. Not a big deal, but it added an unexpected two hours to our day, when we were looking for an easy day to rest up prior to heading across the Gulf Stream overnight. It was a nice morning, though, so we headed on back up to Port Everglades, and out into the Atlantic. It was actually a beautiful trip down the coast, but the wind couldn't have been any more on our nose if we'd stapled it there. We could have tacked back and forth under sail, but we were already a couple of hours later than we thought we'd be, so we just stuck it out and motored into the wind. As we were cruising along, I looked down at the amp meter measuring the electricity being produced by the alternators, and saw that our starboard one was pinned at -80, while our port one was up around +50 amps. Now, I'm no electrician, but I was pretty sure the alternator on our starboard engine shouldn't be producing negative amps. Uh oh. Bad alternator? Potentially dead starting battery on the starboard engine? There wasn't much I could do about it at sea, so I stopped worrying about it, planning on checking it out when we anchored. As we motored across in front of the main channel to Miami, Sara got a call from our documentation agent to say that our Canadian registration was finally in. Awesome! We had all but given up on it, and were planning to have it Fed Exed to the Bahamas whenever it arrived. Now that it had arrived, we had to figure out how to get it before we left the States. 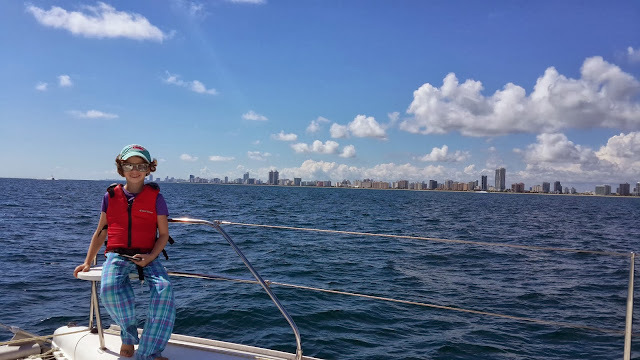 We were planning to anchor in a little bay called No Name Harbor, which is just across Biscayne Bay from Miami, so we decided we could just dinghy across after we anchored. It was only 5 or 6 miles, and since the dinghy goes about 20 miles an hour cranked out, that would only be a 15 minute dinghy ride, right? No problem. On we went, and finally pulled into No Name at around 4 o'clock. Just time to get the boat anchored, check out the alternator, drop the dinghy in the water, and get across to pick up our Canadian registration. Should be easy after a 7 hour motor down the coast, no? I jumped in the engine compartment, and started pulling wires off the alternator and cleaning contacts. After a bit of that, I fired up the engine again, but it didn't seem to be working any better. I then went inside to check our power monitor to see if I could see whether the battery was charging. I figured I could turn everything else off while the engine was running, and our monitor should show me if I was making amps off the starboard alternator. Only, when I looked at it, I found the power monitor display wasn't working. I was sure it had been working a few days earlier, but hadn't checked it recently since we had been on shore power. While I was inside, I heard a squeal from Katie, and looked outside to see what was the matter. She had tried to help lower the bow of the dinghy into the water, but it had been too heavy for her, and the rope had slipped fast through her hands, dropping the dinghy with a splash, and leaving some serious rope burn. Ouch. As Sara tended to Katie, she sent the boys out in the dinghy to get the engine warmed up for our trip across the Bay. 15 minutes later, as I was still messing with the alternator, I noticed Sara staring across No Name harbor. "What's up?" I asked, innocently. "The boys are over there trying to get the dinghy motor going" came the reply. Uh oh, again. No time for the dinghy motor to fail. So, we threw the kayak in the water, and I paddled over. Fortunately, a good swift pull on the starter fired the dinghy up. Christopher paddled the kayak back to the boat, and Alexander and I headed out into Biscayne Bay in the dinghy, now about 15 minutes late leaving. Once out there, I realized the error in our planning. Biscayne Bay is not deep, but it is a fair fetch of water, and the waves had built up with the wind. We were either going to be late, or going to have a wet dinghy ride. As it turned out, we were both. Anyway, we made it to pick up our registration, and eventually got back to Monashee, glad to be pulling in before dark. We sat down for dinner, and just as we were getting started, Katie grabbed the milk with her one good hand, and promptly dropped it on the floor. Pulling out the old adage of no tears over spilled milk seemed to help, but as we were cleaning it up, the no-see-ums attacked us out of the mangroves. In minutes, we were taking refuge inside the boat, as we were swarmed with these nasty little critters. Once inside, with all the windows closed, and the day we had just had, the climbing temperature started to put the icing on the cake. Despite it being the end of October, temperatures here are still easily in the high 30s (Celsius). Well, we had never run the generator yet. We were going to need to know how it worked if we were headed to the Bahamas. Why not crank it up, check it out, and cool us all down with a little A/C? Great idea. Except that, after 10 cranks, a thorough review of the manual, and another 5 cranks without getting the generator to start, we confirmed that we were not going to be able to make it work tonight. Sometimes there is nothing better than seeing the end of the day. Once we settled everyone into bed, Sara and I sat down, and discussed the events of the day. It was pretty clear that neither of us was keen to head to the Bahamas with all those issues still outstanding, and we were far too exhausted to consider getting up in the middle of the night to do it. Even though our weather window was closing, we felt we needed to stop and take stock for another day. With that plan set, we both drifted into unconsciousness.